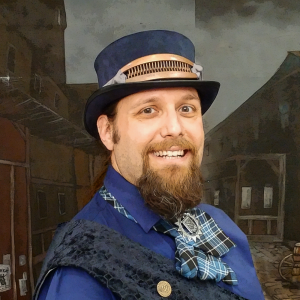 The Tales of Sage and Savant is a monthly audio-drama podcast set in an alternate history Steampunk universe. 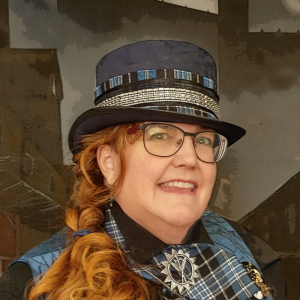 Steampunk is a retro-futuristic imagining a sci-fi future starting from a Victorian past. Sage and Savant exists in a sci-fi universe, which allows the podcast to investigate modern concepts and ideals. The combination of modern ideas and formalized vocabulary help to establish an other-worldly setting for our story. Sage and Savant imagines a world where women achieved the vote when they first began to agitate for it in the 1830s and by the 1890s have begun to achieve some measure of equality. The lead character, Doctor Petronella Sage is angling to become a fellow at King’s College, a fictional university lauded for its Medical and Historical Science Departments. Although Petra has achieved her doctorate and a position at university, she is constrained by official views on her capabilities. Though women in our story have the vote, much like in our own time, they still lag in recognition (and pay) for their scientific and academic successes. Doctor Sage is under immense pressure to perform perfectly and to bring credit to the institution before she has any hope of achieving her goal of becoming a fellow. The Doctor began her investigations into galvanism, which is the study of the application of electricity to human flesh, in an effort to advance the science of limb reattachment. Her desire is to succeed in grafting a limb from a donor cadaver onto a living subject who has lost his arm or leg. A laboratory accident in Episode 101 leads to the Doctor discovering time travel, which she dubs transmigration. Uncertain of the scientific ramifications of this new knowledge, she chooses to hide the research until such time as her experiments produce conclusive results and she can guarantee that her discovery will not be taken from her and given to a more senior, and likely masculine researcher. 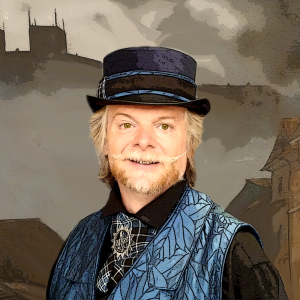 Doctor Sage’s closest friend and traveling companion is Professor Erasmus Savant, an expert in Archeological Ephemera. His skill lies in the identifying and cataloguing the smallest or most obscure historical items. Though his first transmigration was accidental, he has embraced the traumatic process of transmigration, his natural enthusiasm for learning new things overcoming his discomfort at death. The podcast is told in the style of “Radio-Drama” from the olden age of radio. Our Narrator plays an integral role in moving the story along and providing the necessary details to provide the time and place our characters find themselves. In Episode 6: Feet to the Fire, Dr Sage is forced to accept an assistant. As a result, Abigail Entwhistle joins the story and provides a further moral for Dr Sages research. Retro-futurism as explored in these stories is a mixture of old and new, of future tech re-imagined via the avenues of clockwork and steam. The mood of each monthly podcast episode is dictated by the whereabouts of their travel and the characters they encounter there. Since our travelers inhabit lives of other people, they are obligated to try and fit within the society and culture of the host body. 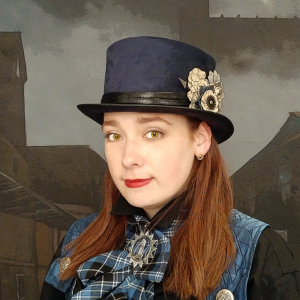 Blending modern scientific knowledge, to make the story plausible; historical research, to ensure periods of history are represented in the right light; Victorian era hubris, to give our characters that air of turn-of-the-century invincibility, Sage and Savant embark on incredible adventures through time. Listen to their story on iTunes, GooglePlay or any podcast app, or visit our website to get more about the research that goes into making each episode.